In a major shock to evolutionary science, a sweeping survey of the genetic code shows the human race sprang from a single adult couple. The research was led by the Rockefeller University and the University of Basel, Switzerland, and stunned all involved. While still holding to an old Earth with these modern humans dating back between 100,000 to 200,000 years, it’s a time far more recent than other claims in the evolutionary theory. In addition, this Adam and Eve, the researchers say, arose after a catastrophic event than nearly wiped out the human race. The Bible’s a story of a couple created by God as a adults. Another surprise for the scientists, however, was that nine of every 10 animal species also come from a single pair of beings. Senior research associate Mark Stoeckle and Thaler, the two scientists who headed the study, concluded 90 percent of all animal species alive today come from parents that all began giving birth at roughly the same time, less than 250 thousand years ago — throwing into doubt the patterns of human evolution. The study also suggests people and animals are very similar genetically to each other. “If a Martian landed on Earth and met a flock of pigeons and a crowd of humans, one would not seem more diverse than the other according to the basic measure of mitochondrial DNA,” said Jesse Ausubel, director of the Program for the Human Environment at the Rockefeller University. Noah’s Ark has been discovered on top of a mountain in Iran after petrified wooden beams were found on the summit, according to the latest conspiracy theories. 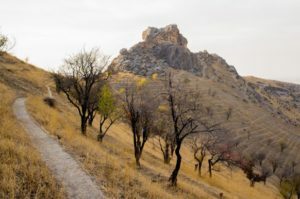 Researchers from the Bible Archaeology, Search & Exploration Institute claim there is strong evidence that the ship is on the mountain of Takht-e-Suleiman. The BASE group says they found wood fragments at the 15,000-foot elevation and took the samples to be analyzed in a lab. The lab found the fragments showed signs of petrified wood. Furthermore, they found microscopic sea life in a rock sample, which is normally found at the bottom of the ocean. Noah’s Ark is one of the world’s greatest biblical mysteries as scientists have struggled to find evidence that the Great Flood even happened. The story goes that God instructed Noah to build the Ark to save his family and the world’s animals from the Great Flood. In September, a 700-year-old map appeared to reveal the location of Noah’s Ark. The Mappa Mundi, in Hereford Cathedral, contains more than 500 ink drawings including amazing “evidence” for apparent locations of key biblical happenings. The huge masterpiece is seen by many history scholars as one of the greatest surviving artworks of the Middle Ages. During the annual meeting of the American Schools of Oriental Research in Denver, Colorado, scholar Phillip Silvia reported the preliminary findings of their excavations in the area, which some scientists consider to be home to the Biblical cities of Sodom and Gomorrah. The results suggest that cities and settlements in the Jordan Valley’s Middle Ghor region, where up to 65,000 people lived around that time, were obliterated with a powerful wave of heat, wind and tiny particles, the outlet Science News reports. According to the Bible, the ancient cities, thought to have been located on the Dead Sea, were wiped away by God for the sinful behaviour of their people. The preliminary findings of US scientists suggest that this region witnessed a major calamity almost 4 thousand years ago, which left it uninhabited for centuries. God looks down on man’s nuclear weapons, and I believe He laughs at our puny attempts at warfare. He has things in His arsenal that make our most powerful nukes look like firecrackers. We first read about these weapons in the 38th chapter of the book of Job. The weather is the strongest weapon that has ever been created, and there is no defense against it. Think about that the next time your ‘small talk‘ revolves around the weather, no small matter there. Contrary to modern-day Laodicean revisionists, the twin cities of Sodom and Gomorrah were destroyed because of unrepentant homosexual behaviour. This was the place where the original LGBTQ lifestyle was founded, and when God pronounced judgement on it in a fiery blast from above, Sodom and Gomorrah ceased to exist. That area today, as you see in the photo, resembles a bomb blast crater after an horrific explosion has taken place. It remains uninhabited to this day. FROM SPUTNIK: Archaeologists from Trinity Southwest University, a Christian higher educational institution in Albuquerque, New Mexico, have claimed civilisation in the Dead Sea region was destroyed 3,700 years ago following a meteor explosion in the atmosphere. Waives also pushed salty water from the Dead Sea, which devastated the soil. The explosion, the researchers argue, “not only wiped out 100% of the Middle Bronze Age cities and towns, but also stripped agricultural soil from once-fertile fields,” Newsweek reports. According to the scientists, a low-altitude meteor explosion caused the catastrophe which wiped out the region, including the ancient city of Tall el-Hammam, where the researchers worked for years. Radiocarbon dating reportedly revealed that mud-brick walls suddenly disappeared in the Middle Ghor city, as only stone foundations remained. A pottery surface found on the site was melted into glass, which may be a result of extreme temperatures. Following the alleged blast, people wouldn’t return to the region for 600-700 years. Humanity has seen several space explosions before. Five years ago, a near-Earth asteroid exploded in the atmosphere near the Russian city of Chelyabinsk, making headlines around the world and even worming its way into a Hollywood movie. This resulted in over 1,000 people being injured (mostly by broken glass from windows blown out by the shockwave). A more powerful blast came in 1908, when an asteroid exploded over a scarcely populated Siberian region on the Tunguska River, wiping away 2,000 square kilometres. “I was picturing red spray paint in my mind and couldn’t understand how that happened because the latest dating could only be 2,000 years ago or earlier,” said Levi. But when she saw the professionally chiseled Hebrew lettering inscribed into the stone column, she realized it was something unusual. Brushing off the dirt, she began to read what was written. “My heart started to pound and I was sure everyone could hear it. My hands were trembling so badly I couldn’t properly take a picture,” said Levi, who dates the column and its inscription to 100 BC. This earliest known engraving of the word ‘Jerusalem’ in Hebrew is a stunning discovery that has archaeologists in Israel weeping for joy. Jerusalem, the City of David, is the capital city of the only land on earth known as God’s Land. FROM THE TIMES OF ISRAEL: While any inscription dating from the Second Temple period is of note, the 2,000-year-old three-line inscription on a waist-high column — reading “Hananiah son of Dodalos of Jerusalem” — is exceptional, as it is the first known stone carving of the word “Yerushalayim,” which is how the Israeli capital’s name is pronounced in Hebrew today. “I was picturing red spray paint in my mind and couldn’t understand how that happened because the latest dating could only be 2,000 years ago or earlier,” said Levi. But when she saw the professionally chiseled Hebrew lettering inscribed into the stone column, she realized it was something unusual. Brushing off the dirt, she began to read what was written. “My heart started to pound and I was sure everyone could hear it. My hands were trembling so badly I couldn’t properly take a picture,” said Levi, who dates the column and its inscription to 100 BC. During an interview on Tuesday, Clinton said that Democrats can be civil toward Republicans when they take back the House, Senate or both. “You cannot be civil with a political party that wants to destroy what you stand for, what you care about,” the former secretary of state said. Clinton would rather see the country thrown into chaos, Ingraham said, than admit Trump’s policies are succeeding. “This is all about foisting a liberal construct on America,” she said. Democrats are actually resentful that the country is prospering, Ingraham added, and they’re displaying Antifa-like resistance. But now academics claim to have solved the millennia-old mystery, bolstering the case for the New Testament’s historical accuracy. Pilgrims have for hundreds of years believed the miracle site to be Kafr Kanna, a town in northern Israel near the Sea of Galilee. And our pictures show precisely the location of the incredible find. Have The Temple Vessels Been Located? Shelley Neese, vice president of the Jerusalem Connection, became involved in the story over a decade ago and has spent nearly eight years writing the The Copper Scroll Project, the story of an unlikely hero who may have unraveled one of history’s most enduring mysteries. In 2007, Neese was the editor for Jerusalem Connection Magazine and she met Barfield at a Christian conference in Texas. Discovered in 1952 near Qumran on the shores of the Dead Sea, the Copper Scroll is unlike the other Dead Sea Scrolls which are mostly religious manuscripts written on parchment. The Copper Scroll, as its name suggests, is engraved on a thin sheet of copper. And, in contrast to the others, the Copper Scroll is a list of gold and silver items and the 64 locations where they can be found. Many archaeologists believe the Copper Scroll is an inventory from the Second Temple.In addition to gold and silver, Temple vessels and priestly vestments are listed. No archaeologist has ever succeeded in deciphering the directions contained in the Copper Scroll and finding the treasure. The book follows the efforts of Jim Barfield, a man who, at first glance, seems entirely unsuited to search for the Temple artifacts, but whose unique skills may have solved one of history’s most enduring mysteries. Barfield, a Noahide who speaks no Hebrew, also has no background in archaeology. A retired criminal investigator for the Oklahoma Fire Department, Barfield was used to patiently sifting through the ashes to find the truth. In 2006, Barfield was interested in the Dead Sea Scrolls and their relevance to Bible study. At first, he was uninterested in the Copper Scroll which had no theological significance. Barfield’s fascination turned into a burning desire after he met Vendyl Jones. Jones, a Texas preacher turned Biblical archaeologist, believed Qumran to be the hiding place for the Temple vessels and spent 30 years searching for them using the Copper Scroll as a guide. Jones discovered a small vial of persimmon oil used to anoint kings and high priests, and a large quantity of what he believed was Temple incense. Barfield met with Jones, now deceased, and Jones suggested he revisit the Copper Scroll. “Vendyl told Jim the Copper Scroll had more prophecy in it than any of the other Dead Sea Scrolls,” Neese said. Barfield’s curiosity turned into passion and he returned to deciphering the Copper Scroll. He searched maps for the “ruins of the Valley of Achor” mentioned in the scroll. The valley is believed to be near Jericho but the precise location is unknown. As a young man, he had piloted helicopters for the U.S. Army. Using his map-reading skills to triangulate, he was able to pinpoint locations on an aerial map of Qumran. Very quickly, pieces of the puzzle began falling into place. In one case, the scroll described steps, 40 cubits long, heading east. Barfield did indeed find stairs. The archaeologist reported the stairs to be 60 feet, or precisely 40 cubits. He also discovered the remains of a pool, precisely 40 cubits long, exactly where the scroll said it would be. He believed he had found many of the locations listed on the scroll but to verify his theories, he needed to visit the site. In 2007, Barfield travelled to Israel to do exactly that, but to pursue his investigation, he needed the approval of the Israel Antiquities Authority to search Qumran. Barfield met with Israel Antiquities Authority (IAA) director Shuka Dorfman. Dorfman was unreceptive at first, but as Barfield laid out his proofs, explaining the signposts described in the Copper Scroll, Dorfman became enthusiastic and arranged a meeting with veteran archaeologist and Qumran expert, Yuval Peleg. Peleg agreed to dig some exploratory holes at the site with Barfield. Less than an hour after beginning shallow test pits, Peleg received a phone call and without any explanation, Peleg shut down the dig. This was the beginning of many bureaucratic stone walls preventing Barfield from verifying his theory. He purchased a sophisticated metal detector that could penetrate 50 feet while differentiating between ferrous and non-ferrous metal, i.e. gold and silver. Barfield applied to the IAA, asking to run a non-intrusive scan of a few spots in Qumran. His request was denied. In 2013, Barfield was in New York where he was introduced to Moshe Feiglin who, at the time, was a Likud Member of Knesset. Feiglin was a strong advocate for the Temple and became enthused when he heard Barfield’s story, even offering to accompany him on a tour of the site. A few weeks later, the two were wandering around the tourist site, a large duffel bag in tow. They visited five spots that Barfield felt were most likely repositories for Temple treasure. One hour later, Barfield ran the data from the metal detector through his computer. Every spot was a hit and one locus especially so. “It showed up on the metal detector like Fort Knox,” Neese said. The Israeli government is still not permitting Barfield to investigate and there has been a moratorium on archaeological digging at Qumran. In fact, the Copper Scroll, an ancient artifact inscribed in Hebrew, is currently in a museum in Amman, Jordan. In an interview with Breaking Israel News last year, Barfield stated his motives. If Barfield is successful, it will bring the Third Temple much closer. Not only does Neese chronicle this amazing story but she was an integral player in much of it. A native of Louisiana, she first came to Israel in 2000 with her husband, a U.S. Air Force physician. With no knowledge of Israel, she became intensely curious about the country and received her M.A in Middle Eastern Studies from Ben Gurion University. She spent the months leading up to the Gaza disengagement in 2005 in Israel, working with a team of negotiators. When she went back to the U.S., she became the assistant to the Consul General at the Consulate of Israel to New England. Egypt’s second sphinx reportedly has been found buried in the ancient city of Thebes, bringing a stop to infrastructure construction in the area after the buried statue was detected, RT.com quoted local reports on Tuesday. Its existence had long been rumored. Mohamed Abdel Aziz, the director general of antiquities in the area, said construction workers found a statue of “a lion’s body with a human head” while doing roadwork between the ancient temples of Karnak and Luxor. The news website Youm said statue could not be lifted to the surface at this time “due to the nature of the environment it is in,” according to RT. A sphinx adjacent to the Great Pyramids is the world’s best known of the statues, History.com said. 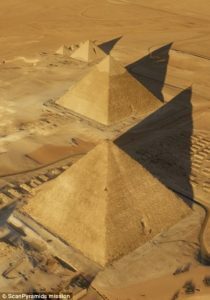 The Great Pyramids of Giza, built when Egypt was one of the richest and most powerful civilizations in the world, are some of the most magnificent man-made structures in history. The $12.7-million Al-Kabbash road project, which was scheduled to be finish by 2018, was supposed to allow easier access for visitors in the ancient area, according to Egypt Today. The news outlet eaid the excavation and restoration of Al-Kabbash road started in 2005 but has faced delays. Thebes and the two temples date back to 1400 BC. Original excavations of Luxor temple started in 1884, leading to “significant discoveries” until work there ended about 1960. The majority of the pharaohs of the 18th to 20th dynasties, who ruled from 1550 to 1069 BC, rested in the tombs which were cut into the local Egyptian rock, The Guardian reported. The royal tombs were decorated with scenes from Egyptian mythology, which likely revealed their beliefs and funerary rituals of the time. Nearly all of the tombs have been opened since and have been looted of their riches centuries ago, but the gravesites still give an idea of the power of the Pharaohs, the Daily Mail said. The sphinx is believed to be a symbol of royalty in ancient Egypt, RT said, and worshippers carved the heads of many pharaohs into statues for their tombs to mark their relationship with the lioness solar deity Sekhmet. 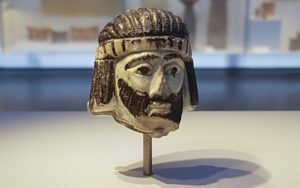 A small carved sculpture discovered in the ancient city of Abel Beth Maacah in northern Israel, and dating back over 2,800 years, could be a depiction of a biblical king, according to archaeologists. Robert Mullins, a professor at Azusa Pacific University’s Department of Biblical and Religious Studies, who is co-director of excavations in the ancient city, said last week that the sculpture was found last summer in a large building at the highest point of the city. The figure, only 2 by 2.2 inches in size and carved in a type of glazed ceramic, depicts a man with long black hair and a beard, wearing a yellow and black headband. The head was originally attached to a figurine that would have stood 8-10 inches in height. “Despite the head’s small and innocuous appearance, it provides us with a unique opportunity to gaze into the eyes of a famous person from the past; a past enshrined in the Book of Ages,” said Mullins. All three of the figures mentioned by Mullins are found in the Bible. King Hazael is mentioned in 1 Kings 19:15, with God telling the prophet Elijah to anoint Hazael king over Aram Damascus. King Ethbaal is found in 1 Kings 16:31, where he is referred to as the father of Jezebel. Azusa Pacific University, which is an evangelical Christian university, pointed out that Abel Beth Maacah is itself mentioned on several occasions in the Hebrew Bible, and has been the site of a number of notable discoveries. Mullins and his research team have been excavating the remains of what could be an ancient citadel dating back to the time of the Israelite kings, with the rooms containing evidence of metallurgical activity, as well as Phoenician storage vessels. Separately, technological innovations have been aiding archaeologists in their study of evidence dating back to various biblical kings. In June 2017, high-tech imaging allowed Tel Aviv University researchers to read for the first time the inscription on the back of an ancient pottery shard that was discovered back in 1965, but had been unreadable until then. The shard has been dated back to 600 B.C., before the destruction of Judah’s Kingdom by the biblical King Nebuchadnezzar, one of the most important characters in the Book of Daniel.